Posted December 4, 2015 by Roxanna Brock McDade & filed under Cabo, Christmas, Festivals / Events, Holidays, Oaxaca, Puerto Vallarta, San Miguel de Allende, Tulum. It’s getting down to the wire for planning a Christmas vacation, but you still may be looking, and I’m here to help. 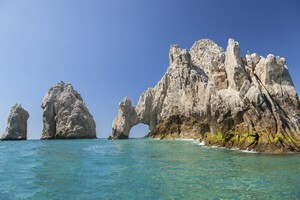 If grand parties and festivals, affordable prices and warm weather is what you are looking for–then Mexico is for you. These cities offer tons to do whether you’ll be on a family vacation, beach bumbing or partying. And don’t forget to check the temperatures. Besides providing information on each city, you will also find Christmas celebrations taking place that are specific to each location. At the end of the article you will find the celebrations that take place in all of Mexico. Once an old fishing village, Cabo San Lucas is located at the tip of the Baja California Peninsula, in the Baja Sur state. Now a popular beach tourist destination, there is a plentitude of different beaches, each with its own flavor and attractions. The amazing rock formation, featuring a natural arch, is El Arco de Cabo San Lucas, the defining natural landmark of the area. Activities include snorkeling, scuba diving, parasailing, surfing, stand up paddle boarding, boating, whale watching, deep sea fishing, horseback riding and more. Numerous activities take place at hotels and restaurants throughout Cabo San Lucas during the Christmas season. Oaxaca is the capital of the Oaxaca state in the foothills of the Sierra Madre mountain range. The city centro (center) has been designated a World Heritage Site by UNESCO. It has a high number of colonial Spanish structures, as well as archeological sites. Festivals and celebrations in the city melt traditional and indigenous traditions and are very colorful. Oaxaca is also popular for its Mole, a Mexican sauce created with chocolate. History, art, culture, food, shopping and parks are plentiful and exquisite in Oaxaca. There is something for the whole family here. December 16 – Calenda or parade to La Virgen de Soledad. Indigenous people from surrounding areas converge on the city center (Zócalo) to perform the Danza de la Pluma and celebrate the beginning of Posadas. December 16-31 – “breaking of the plates” takes place outside the Cathedral Restaurant, where you are served hot chocolate and “Bunuelos,” a traditional Christmas pastry, and then you break the plate. December 23 – Noche de Rábanos (Night of the Radishes). 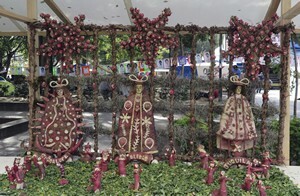 Locals create different flowers, animals and nativity scenes from radishes and display throughout the Zócalo. December 24 – Called the ninth Posada, includes a parade around the Zócalo, before participants go to their church and celebrate Mass. 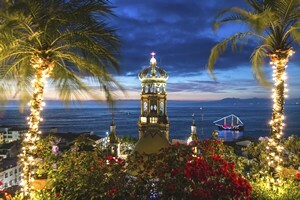 Puerto Vallarta sits on the Bahía de Banderas (Bay of Banderas) on the Pacific Ocean, in the Mexican state of Jalisco. It encompasses nearly 40 miles of coastline on the western edge of the jungle of the Sierra Madre Mountains. It is a popular tourist spot, with numerous activities including zip-lining, surfing, snorkeling, shopping, touring the old cobblestone streets of the city center and Malecon, site seeing 20th-century churches and buildings, enjoying amazing food, art, music and clubs. Direct flights to PV are easy to find, making it a great last minute Christmas getaway. December 24 – Noche Buena. Food, drink, piñatas are enjoyed by young and old alike. A UNESCO World Heritage Site, San Miguel de Allende in the state of Guanajuato, is considered the most beautiful city in Mexico. Located in the highlands of central Mexico, the city is known for its narrow cobblestone streets, 17th and 18th Century architecture, art galleries, boutiques, European style café’s and culture. 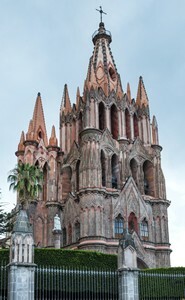 In the early 20th century, the colonial buildings of San Miguel de Allende were discovered by foreign artists, who began to settle there, giving the city its artistic notoriety. Today artists, share the town with writers, tourists and a large expat community. It’s best to explore the city by foot, especially the historic center. A tourism trolley also offers sightseeing opportunities. Numerous art workshops are available for aspiring artists or those wishing to dabble. One can also find cooking and Spanish classes. Bici Burro, a bike shop in town, rents bikes to explore the surrounding villages. December 16th – a large procession through town, ending in celebration at the “jardin” or city center. Christmas Day is a family occasion in San Miguel de Allende, so most of the town is closed. Make sure you have accommodations with other tourists, so you can share the holiday. Located just 80 miles south of Cancun, sits Tulum, on the east coast of the Yucatan Peninsula, in the Mexican state of Quinta Roo. Tulum National Park, sitting on 40-foot cliffs above the Caribbean Sea, houses 13th-century Mayan Ruins, considered some of the best preserved in the world. Other Mayan Ruin sites are found in the surrounding jungles, as well. The biosphere reserve of Sian Ka’an and 10 or more Cenotes are also popular tourist attractions. 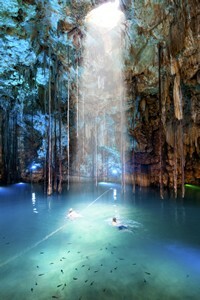 Cenotes are created when the roof of a cave collapses, creating a hole or opening into, oftentimes, large caves. These are very unusual and picturesque. In Mayan times, they were the only source of fresh water available. You can count on having a white Christmas on the sugar-white sand beaches of Tulum. December 16-24 – Las Posadas involves processions through the streets representing the Joseph and Mary looking for a place to have the baby Jesus. Pastorelas, religious performances, also take place during this time. Now that you know what place fits your Christmas agenda, get a flight and head down now. You won’t regret it. Oh-so Happy Holidays!